Situated right next to a ball field the effect is one of grassy spaciousness. Also has a small recreation center that is more active than most. 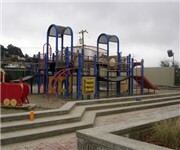 How Would You Rate West Portal Playground?